Completing the Rudder Bearing Repair. 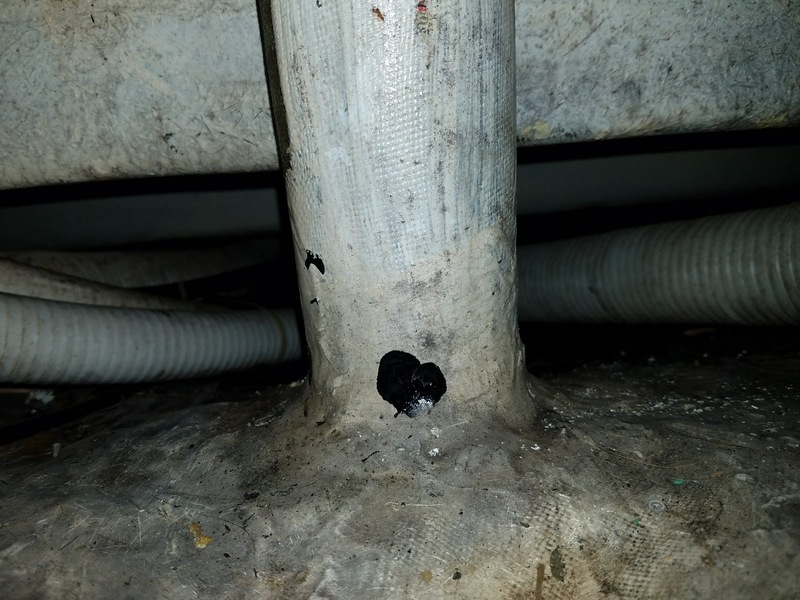 As mentioned previously, the lower bearing of the Rudder had slop that was reported by the Surveyor when we purchased Eximius in 2015. We dropped the rudder carefully when the boat was hauled out last week and now it's time to complete the Rudder Bearing Repair. Original plan was to complete the repair while the boat was in the crane straps during preparation for launch, however, after reading the instructions for the repair over several times, I did not feel comfortable trying to get everything back together when we were expecting to put the boat back in the water. The risk of something taking longer than expected was pretty stressful. So we bit the bullet and had the crane come over and lift the boat so that we could replace the rudder and complete the repair. Now to describe the repair. 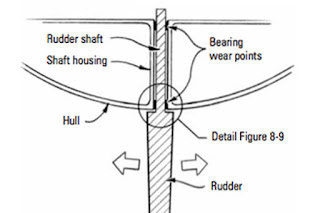 Only the lower area of the rudder shaft housing was worn, there was basically no movement of the rudder post at the top of the rudder shaft housing. This pic looks pretty simple. That's a bit misleading. 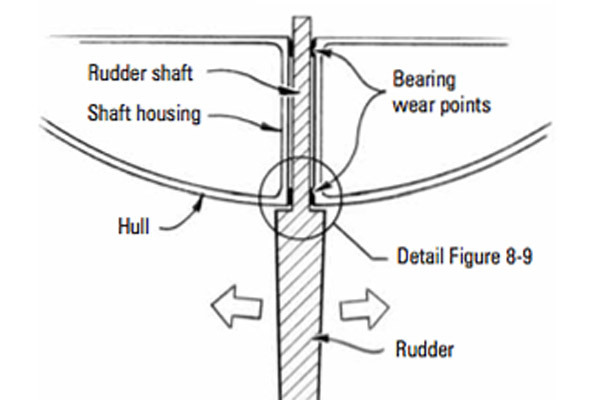 The post passes up through the housing, the rudder post stuffing joint and the rudder steering quadrant, none of which are shown in this pic. This describes the form of the repair. 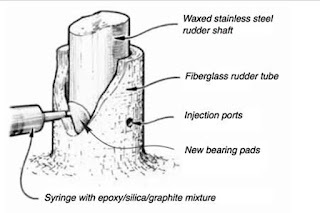 Basically, an Epoxy/Silica/Graphite mix is injected into the gap between the rudder post and the rudder shaft housing. Step 1 is to remove the rudder, we did that during the haul out before the boat was lowered onto blocks. 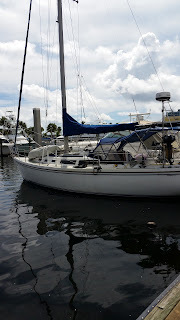 That gave me the opportunity to repair some damage to the bottom of the rudder that occurred when we went aground in Biscayne Bay last year. 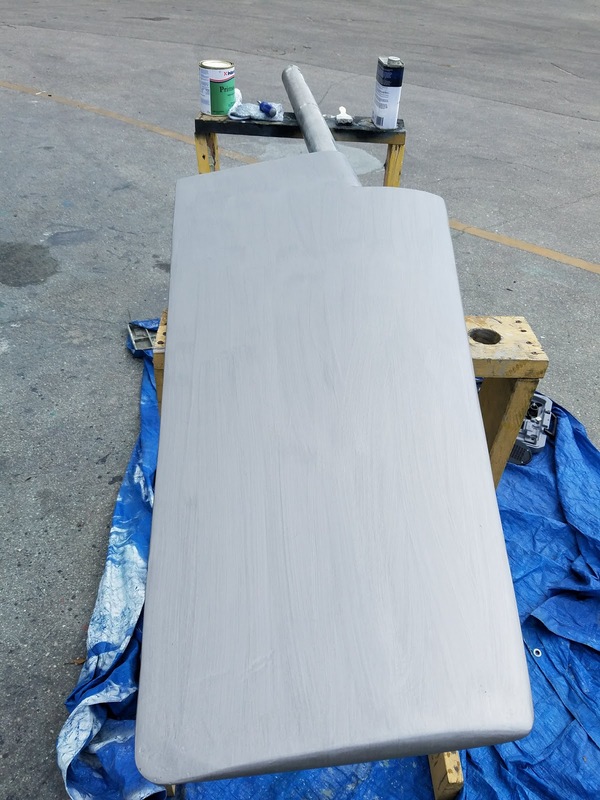 With the rudder out of the boat, the damage repair was easy, just grind away to a solid depth and then fill with epoxy and filler, the area was too small to need much glass. Then the rudder was primed ready for re-inserting into the rudder housing. 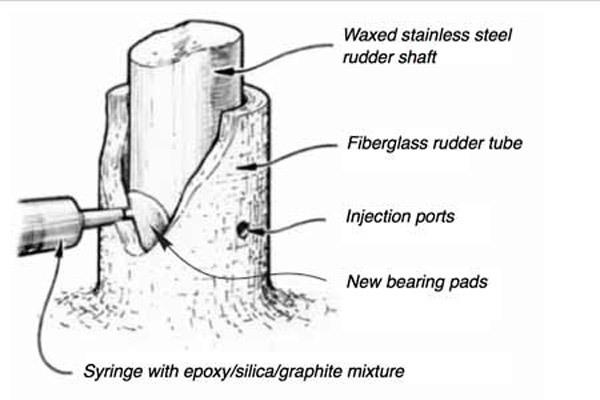 The repair kit instructions required that the rudder post be clean, free of any burrs or 'divits' and then waxed. So I used 1200 grit wet and dry paper to clean up the rudder post and felt that it was in good shape. Step 2 was to Wax the rudder post. I measured the depth of the rudder shaft housing and the depth to the holes drilled in the housing. The holes are about 5" above the lower edge of the shaft housing. So I applied solid wax on the lower 10" of the rudder post. I was concerned that when the rudder was being re-inserted, that the wax would make it awkward to handle. For that same reason, I did not apply Anti Fouling bottom paint to the rudder except for the part that would be out of reach when the rudder was installed. Here's a pic of the one of the holes drilled in the rudder shaft housing, there are 3. It was really awkward getting into that area in order to apply the epoxy/silica/graphite mixture, but it worked. Once everything was back together, I spent another 2 hours aligning the wheel so that a wheel spoke was vertical when the rudder was dead amidships. Peggy was watching the position of the rudder as I made multiple adjustments to the wires from the steering wheel to the steering quadrant. The new flax insert into the stuffing box seems very well compressed, so I really hope we have minimized the risk of leaks from the top of the lower part of the rudder shaft housing. Lessons learnt: Double check everything before re-inserting the rudder. Get new Bolts and Nuts for any that seem corroded, have a Car Jack handy for lifting the rudder up into the housing. And wear long sleeves, my arms are pretty scratched up from snagging the steering wires while replacing the bolts in the steering quadrant. And - Don't even think of doing this while hanging in the crane straps, The epoxy mix requires 8 hour to cure. Outcome: The wheel feels much better, less sloppy and is now nicely aligned. I'll have to do a bit of ropework on the wheel to identify the centered rudder position.